A stronghold for the valiant. What started as a coalition of Human territories became something stronger and more honorable than the sum of its parts. Comprised of several races of Azeroth, the Alliance has been a stronghold for the valiant and upholder of honor since its inception. But how did the Alliance form and why has it been so successful? Time to find out! The Alliance of Lordaeron was a political venture comprised mainly of human races, with the exception of the High Elves of Quel’Thalas and two current Alliance members, the Dwarves of Khaz Modan and the Gnomes of Gnomeregan. They fought the Orcish invasion from Draenor off together, and enslaved those Orcs unlucky enough to be left behind thereafter. Unfortunately, this splintered the Alliance greatly, as many were against internment camps or their ensuing cost, and the High Elves departed along with several Human factions. Decades passed, and the end of the Alliance of Lordaeron came to pass at the hands of one of its own: Prince Arthas Menethil, Crown Prince of Lordaeron. In his self-righteousness, he concluded that the only way to rid his people of the undead plague spreading across the nation was to enact the culling of Stratholme, an event which would trigger a domino effect of decimation across the continent. Walking into Lordaeron after falling to the influence of the Lich King, Arthas slew his father and brought chaos to the city, tearing it down stone by stone before the start of the Third War. The city of Stormwind was soon rebuilt and became the home to the new Alliance, formed after the Third War against the demons of the Burning Legion. Consisting of the Night Elves, a now-mortal race with a burning dislike toward the Horde, and the Draenei, an alien race who had faced the brunt of the Burning Legion on their homeworld, the new Alliance was formed. King Varian Wrynn was the leader of the Alliance– that is, until he disappeared under mysterious circumstances en route to a meeting with Jaina Proudmoore, a representative of the Magi of the Kirin Tor, and the Horde leader Thrall. From that point onward, his infant son Anduin was proclaimed king, with a council to help him lead in his youth. The Alliance had its own secrets and corruption and, like many great nations, came close to the brink of collapse. Anduin’s main counsellor, Lady Katrana Prestor, whispered in his ear until the return of his father, who re-assumed command of Stormwind and continued to rule. As it turns out, that Varian was a fraud and the rightful King of Stormwind laid siege to the city, calling out Katrana Prestor as a mere visage of the creature she was: Onyxia, a member of the Black Dragonflight. After her demise, peace returned to Stormwind and the Alliance continued to forge ahead as a naval powerhouse and masters of magic. Anduin in particular formed a strong bond with Jaina, learning the arts of the arcane while training to become a Priest of the Light. He learned compassion from his father, who was able to find redeeming qualities in even the most irredeemable of his foes: Garrosh Hellscream, former Warchief of the Horde and destroyer of Theramore. Eventually, the Worgen of Gilneas, a former member of the Alliance of Lordaeron, pledged their allegiance to the cause after being assaulted by the Horde themselves. Despite the atrocities committed by Garrosh’s Horde toward the Worgen and their fellow Alliance races, both Anduin and Varian saw the good in those remaining to lead the Horde. Anduin agreed with the Black Dragon Wrathion’s ideals of peace and unification toward a better future. When the time for commitment to a common cause presented itself, Anduin was a voice for the reestablishment of communication between the Horde and the Alliance. And so the Legion returned to Azeroth. During the Battle of the Broken Shore, the Alliance felt the sting of betrayal when the Horde retreated after a grievous blow was struck to their Warchief, Vol’jin. The retreat was sounded, but Gul’dan summoned a gargantuan Fel Reaver which attached itself to the side of Varian’s retreating ship. Passing a note supporting his son’s vision of peace and prosperity to Genn Greymane, leader of the Worgen, Varian sacrificed his life in order to save those retreating on the Gunships. Every member of the Alliance felt the stinging blow of his death. A memorial was erected in Varian’s honor: Lion’s Rest in Stormwind. Anduin became king once more, a crown that weighed heavily on his priestly shoulders. 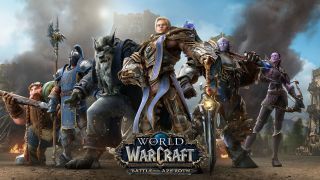 Now a leader of an army and the entirety of his faction, Anduin has been forced to reconcile his principles with the reality of the world of Azeroth. It has been a sobering experience for the once-boy king. With the Legion defeated, Anduin wanted peace but the discovery of Azerite, a powerful substance used for machinery and weapons, led to problems greater than he could have ever anticipated. Scouting out the Horde’s mining of the Azerite in Silithus, the Night Elf army moved ever closer, spying on their actions and reporting back to the Alliance leaders. Unfortunately, their scouting would be noted and, fearing for the future of her people at the hand of the Alliance, Warchief Sylvanas Windrunner of the Horde struck first. The War of the Thorns began. Anduin quickly found himself at the mercy of the Horde. Bearing down on Darkshore from a crusade originating from Orgrimmar, the Horde took the unsuspecting Night Elves by surprise. Without an army to defend them, the leaders of the Night Elves Tyrande and Malfurion fought valiantly to save their people but, ultimately, the strength of the Horde proved too much. The Horde advanced, and the great World Tree, Teldrassil, fell in flames. Now, it’s time for the Alliance to strike back. Fighting for survival in the Battle for Azeroth, their next target is the seat of Sylvanas’s true power: Lordaeron, the city under which the aptly name Undercity of the Forsaken exists. How the battle will end is unknown, and the outcome of such an outstanding counter strike remains to be seen. What will happen when the dust settles after the War of the Thorns? Battle for Azeroth will tell all for the Alliance!